Articule: Alyson Clay, Graham Gillmore and Richard Prince. Dazibao: Katie Campbell, Trudy Rubenfeld and Ian Wallace. Oboro: Gathie Falk and Jerry Pethick. Optica: Joey Morgan and videos by S. Diamond, Ivo, T.T.V., E. Vander Zaag, P. Wong and C. Wyngaarden. Skol: Greg Murdock and Charles Rea. The large space is virtually empty. There is only a tired looking armchair which faces, from a slight distance, a kind of low table constructed of wire netting. On top of the table are ten wooden frames, each except the outer ones equiped with a light grating representing the walls and roofs of houses. Directly behind, in an immense photograph, a bulldozer and the studio extracts of the demolition. Then appear their metaphorical variations: the small houses with their razed foundations and the sounds of a piano being destroyed. Into this metaphorical level, a countersubject is introduced which sems to transform the theme of demolition into the more abstract theme of deconstruction. The piano exercices, as well as the tiny houses with the malleability of wax, are an apparent reference to childhood, to the patient learning of musical skills and even to the privacy and protection afforded by a home. This deconstruction thus interacts with a reconstruction which is at once musical, plastic and physical. Furthermore, "Fugue" would seem to have a second metaphorical level, becoming an allegory of the very process of artistic creation in the postmodernist age. It involves more than the illegibility of signs and loss of meaning: it signifies a reconstruction, out of disorder and explosion, of a more limited and circumstancial meaning, centered on the very act of composition. We may thus regard the worn out chair, which keeps us at a distance, as designating a space for both audio perception and a maximal reading of the work, and as referring to the temporality of this position. All of this, however, combines in paradoxical fashion with the possibility of a purely aesthetic enjoyment of the work, with the attractiveness of its aura..."
Dumont, Jean, « Expositions: Quand les parallèles font le cercle... », Montréal ce mois-ci, Janvier-Février 1987, p. 14. Daigneault, G., « Melvin Charney chez René Blouin: Venise n'est pas en Italie », Le Devoir culturel, samedi 31 janvier 1987. "Since 1982, the body of work which I have undertaken has taken me back to the fundamental roots of the sculptural form, bringing to light in their creation a new awareness of life and of the environment for our Western culture. It was at this point that I began to build a foundation of new symbols for us to remember by and also to look ahead of the future. The fundamental basis for this new work became different animals and fauna, which we as modern man so easily overlook in our large glass and steel cities. In delving into the background of the animal itself and the way others perceived them and revered them in the past, it brought to the forefront how I myself should depict them; as in the 'murder of crows' .. i.e. –murder: an angle sized plural. Why should the comedian of the bird world be depicted as a murderer? Also, turkey vultures, revered by older societies and ours, hated and hunted for no apparent reason. It is through these members of our world that I hope to give a new perspective on our ever-changing world. We are now surrounded by a constant flow of ideas and images, all based on man, as the centre of our planet and in many instances have lost the ability to look upon our planet as a whole. In bringing into gallery situations old images with a more modern interpretation, it is a new and perhaps final chance to come to grips with what we are, as modern man, and the responsibilities we have: not to have selective memory or perception of both past, present and future. For the next year I shall be exploring new avenues in this direction. At present I am building a full-sized white rhino, following which I shall be producing a piece on the four phases of the moon involving owls; and a stand of full sized musk oxen in the circular defensive position. The works will be exhibited in Toronto and Montreal this year and your assistance would be greatly appreciated." Auteur inconnu, « L'art à l'oeil: Zilon et ses bombes », Le Matin, Montréal jeudi 20 février 1987, p. 17. Ironically, Lorraine Gilbert’s colour photographs of Vancouver and Montreal at night bring to mind Henri Cartier-Bresson’s essay, “The Decisive Moment”. For Cartier-Bresson, the “simultaneous recognition, in a fraction of a second, of the significance of an event, as well as the precise organisation of forms which give to that event its proper expression” was the essence of the photographic experience. But while Gilbert’s photographic activity- her perceptions and technique- bears resemblance to Cartier-Bresson’s, “the decisive moment” here is not her own experience but one which she gives to the viewer. It is her subject. And, for Gilbert, “the decisive moment” is not a fraction of a second but a determinate few moments. Coloured light illuminating her scenes, moving through the frame, exposed over seconds and minutes describes the passage of time and infers its continuum. Like Cartier-Bresson, Gilbert’s “thinking is done before hand”. She selects her otherwise mundane locations for their potential. All in one image, what might happen becomes what did happen, evidenced in the trail of light patterns throughout the scene. The warm orange glow of an interior space insinuates activity within. A person approaching a parked car will inevitably turn on the ignition and the lights and drive away. The static form is illuminated by the street lamp, taking on a life of its own as the tail lights and subsequent motion describe its departure. Jayce Sallum, describing Gilbert’s early night photographs of suburban gardens (1982), suggested that they “seem to preface an unwritten novel” (1). Bob Sherrin, writing on her portfolio of Vancouver street scenes (“Nuits Blanches: Night for day”- 1983) found in them the character of a “stage set or drama” (2). With Gilbert’s upcoming exhibition at Optica we see both drama and action- elements of the novel and theatre- becoming cinematic. Gilbert’s frame sights an erratic, frenetic collage of human constructions. Streets intersect with buses and poles, fences with walls. Light gestures across the sharply static architecture, in the foreground and distance simultaneously, disorient. The camera eye becomes the viewer’s eye caught up in, recording, involved in the action at hand. The combination of natural and artificial light lend to her otherwise mundane urban scenes, surreality. A main artificial light source, printed white, deceives the viewer’s perception of natural light. What was natural is now colour cast, seeming somehow artificial. Conversely, what is artificial becomes strangely animate. Fluorescent buses and telephone booths, tungsten halogen lit benches and neon signs, set against an exaggerated night sky, come to life leering forward, outward, inward. Human beings, when they appear, watch, dwarfed by their own creations. For Gilbert “the decisive moment” is a theatre of the absurd. "By the juxtaposition on the same photographic paper, of two images representing independant spatial and temporal settings, I compose a unique photograph, that engenders a new visual environment and suggests a different reading. The construction of this juxtaposition is made according to a constancy; the simultaneous interaction between the image of a subject, a person, and one of a place. By the assemblage of these two, I attempt to enlarge the field of representation, transcend the literal reproduction. The state of mind that characterizes each setting, is one of a mobility of thought, a flight from the present time, where we hesitate between the past and the future, between dream and reality. The concern that determines each one of the compositions, is the mutual prolongation of the components, by the dynamics of the forms, a rythm, in order that their union brings a "total image", a different representation that occupies the entire space of imagination. To construct a pensive photograph, enrich and transform the meaning of the image." -”Avant-garde, what does this mean for you today? One may discard the hypothesis of the “avant-garde”, watch it become diluted in other converging, diverging hypotheses, interflowing with them, provided that their hypothetical nature has been acknowledged. In some ways, this has been done in the narrative and photographic methods employed by Gerz. It is not done in the industry of culture, as in many other things. Gerz cannot completely abandon the hypothesis, then, and he does not vitiate its universalist pretensions, its militant character. Avant-garde, photography and narrative intermingle without really going in the same direction, keeping their own mobility while at the same time seeking the same state of “indifference”; the “thing” that results will have no specific “genre”, be it photographic, literary, conceptual, expressive. It is a kind of chaotic impulse, a gestative-meditative form that relates to what Kristeva terms the semiotic chora: a lethal state, archaic, fusitive, preceding any birth of a symbolic nature. Within- rather than beyond- these divergencies of genres or traditions, these works are, in the most neutral sense, regressive. Although they run counter to the idea of a perpetually extended avant-garde (towards the future), they are nonetheless not entirely slack (towards the past). They are rather distended. Distended between the text of an immemorial human voice- murmurs that are sometimes mythological, sometimes meditative- and the image of instantaneous memories- repetitive, photographic flashes- of things seen and undoubtedly forgotten; one hesitates between the call (ear) and the recall (eye). It is the process of nostalgia. It involves stopping time in flight, letting oneself get caught between its extremities: instant/eternity, before/after. In opposition to the call (as trompe-l’oeil, since it is a text) is the centrifugal calligraphy of the photographic flashes, fractionalized memory, through which the real once again escapes. Black and white photography, like writing, like shadows, unquestionably falls within the province of abstraction. Between the two, between eye and ear, is a blind spot where time stops, whereby memory is activated. In flight. Durand, Régie, Catalogue d'exposition. « Jochen Gerz; Dimanche, tous les jours dimanche », passages – Troyes (1981). Programme Goethe-Institut, Montréal. avril-mai-juin 1987. Since my last show at S. L. Simpson Gallery ("Rootings, plantings and other insertions"- cf C Magazine, Spring 1986), I have been working on three large sculptural pieces as well as gathering photographic imagery of a variety of industrial sites. The sculptures are a smokestack constructed in a kind of woven pattern, which reflects the dynamism of the stack’s shape, and movement of smoke. Choosing to build up the smokestack and its particular pattern with wire amplifies the physicality of such a structure and invokes a more expressive quality to the piece. The next component is an enlargement of the parts of the ear. The piece is partially suspended and balanced from a central column similar in look to a hydro standard. The outer ear is made in a combination of materials, which focus on the topography and movement through the interior, whereas the outer and the inner ear will be hallow to allow for air to move through them or at least give the sense of resonance in the piece. The third part of the show is a latex rubber casting of a rock crevice, which sits in a plywood crib work. The design and pattern of the support structure for the latex uses the system commonly used for bridges, trestles, and hydro standards as well as being indigenous to the area where the casting was done. To do the casting, I spent five days in Cobalt, Ontario taking the impression of my particular rock surface. I chose the location because of its mining history as well as the physical evidence and interplay of industry and the environment. The spot I cast in overlooked a former lake, which has turned to desert as a result of mining operations pouring into the late. During the same time, I have also been documenting various industrial sites. Some of them include stone quarries, logging sites, mining sites, steel mills as well as natural terrain and elements, soil, water, sky. The most concentrated time has been spent at Inco in Sudbury. To date, my photo pieces are approached by using one roll of film to make one image: I execute these composite images either by standing in the centre of the location and doing a 360 degree photograph, or shooting a spot as I drive. Shooting while driving offers certain variables since I don’t look through the camera to compose, rather I point which I drive without looking. These images become more about peripheral vision while the first approach shows the site. The cohesive aspect of this work is that all these elements deal with particular sensibilities as they relate to industry and the environment. However the work is not intended to point fingers, rather it lays out various clues and evidence of our involvement and complicity in the value systems operating in our culture. That of the environment as commodity. Gravel, Claire, « Le monde miné de Lee Paquette », Le Devoir, samedi 16 mai 1987 C-11. Boileau, Jean-Marc, « Arts et spectacles; Allons jouer dehors! », Liaison St-Louis, 13 mai 1987. p. 12. © Page couverture l Book cover, Table-Tableau-Toile, la demeure et l’exil, 1987. This exhibition has been organised and is being curated by three board members of Optica: Michel Denée, Yvonne Lammerich and Jacques Doyon. The show consists of four Quebec artistes whose work shares both visually formal, as well as poetic affinities. 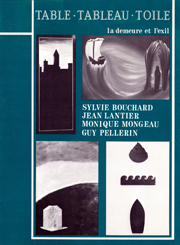 These artists are Sylvie Bouchard, Jean Lantier, Monique Mongeau and Guy Pellerin. "Table- painting- canvas" essentially stands for the interaction of pictorial and real space. The title also puts into question the linear demarcation between painting and sculpture. In the work presented we see the diverse approaches in the confrontation of this issue. For instance, the pictorial support structure of Guy Pellerin also acts as sculpture. The projection of three-dimensional objects from a two dimensional surface is a further extension of this dialogue in the case of Monique Mongeau. Sylvie Bouchard’s paintings in installation were using all of painting’s illusory attributes to amplify real space. In the work of Jean Lantier painting and sculpture (and recently the photograph) become appropriated as signs, creating intertwined fragmentary landscapes and architectures. Within the work of each of these artists the pictorial illusion dominates in a variety of ways, but at the same time it is always infiltrated by the real space. The home and the exile: this opposing concept is also an element that unites these works. A nostalgic atmosphere pervades, strongly suggesting a symbolic universe seeking to materialize itself through the imagery of home and the open sea. Isolated habitations within deserted and undefined landscapes, vague urban silhouettes juxtaposed against geological and celestial cycles of time and space, small vessels, thrown on the open sea, discovering a surreal and magical world to its extreme borders, or, more schematically, boat on a tempestuous sea looking for the inaccessible ziggurat; all these images are part of a symbolic representation of our relationship to the universe. The text for the catalogue, written by Michel Denée, tries to demonstrate through the work of previous generations the permanence of this symbolism in Quebec art, showing the existence of a formal and mental climate perhaps particular to Quebec. For fifteen years Optica’s objective has been to make available to the general public and in particular to the Montreal artistic community exhibitions by both Canadian and international artists. We would now like to utilize the reputation we have established by enlarging the visibility of Quebec artists outside of Quebec. For this reason, amongst others, we have organized this exhibition, which we want to circulate to different regions of Canada in 1988. Gravel, Claire, « Nos Choix; Arts Visuels », Le Devoir, vendredi 19 juin 1987. p. 15. Racine, Robert, « Table-Tableau-Toile: la demeure et l'exil ; Optica, Montréal, 30 mai au 20 juin 1987 », Vanguard, November 1987 p. 41. Beaudet, Pascal, « Une atmosphère symboliste », Vie des Arts, décembre 1987 p. 64. An exhibition from Saguenay-Lac-St-Jean, Eastern Townships, Outaouais, Maurice, Eastern Quebec and Abitibi-Témiscaminque. "Québec en Régions" presents fourteen artists from different regions of Quebec selected by the representatives of seven artist-run centres of Montreal. Without claiming to faithfully portray the complex artistic reality of these regions, this exhibition reflects, however, some of the differences in their conditions of creation and diffusion, relative to those, which prevail in Quebec City and Montreal. "Québec en Régions" also investigates the relationships that the artists sustain with their local cultural heritage. OPENING and LAUNCHING of the CATALOGUE by “l’Illustre Inconnu”: Saturday, September 5, 1987 at 12 p.m. at Artexte, 3575, St-Laurent Blvd. #303, Montreal. OPENING: Saturday, September 5, 1987 from 2 to 5 p.m. in the various centres. Margo, Deborah, « Québec en région; Six artist-run galleries; Montreal; September 5 to 27 » Vanguard. December 1987-January 1988. p. 36. Gravel, Claire, « Quatorze artistes des régions envahissent Montréal sous l'égide de l'Illustre Inconnu; Une découverte: Marie Lippens », Le Devoir, Samedi 5 septembre 1987, C-17. Boileau, J-M, « Au 4060 et au 3981 Saint-Laurent: Artistes du Québec en visite sur la « Main », Liaison St-Louis, 16 sept. 87. Allen, Gregor and Andy Flynn, "A concentrated exhibit", The McGill Daily, Thursday, Sept. 10 1987. p. 7. Guilbert, Charles, « En région: L'aigrie Culture », Voir, vol. 1, no. 39. Dumont, Jean, « Riopelle Noland: des toiles et des noms », La Presse, samedi 17 octobre 1987, J7. Miller, Earl, "A Linear Narration: Post Phallocentrism", Parachute, déc. janv. fév. 87-88, p. 42. “In a space originally intended for photography and bearing a name that reminds us of this fact, it seemed interesting to use this medium in slightly modified artistic conditions: the celluloid of the illuminated, promotional crates is integrated into a structure (the crate) which is a reference not only to an essential element of artistic life (transportation), but more specifically to sculpture (the three dimensions) and to minimalist sculpture in particular (the crates of Donald Judd). These three-dimensional structures, in the context of the site, appear to have an autonomous existence (they clearly display the transitory nature of their installation, indeed their next destinations). The status of the images presented, on the other hand, is more ambiguous: some imported images were taken elsewhere, whereas others appear inextricably linked to this present exhibition (photographs taken in Montreal, in the gallery, of this very installation) and inadaptable to any other situation, while at the same time the fact that they are already in crates suggests a new displacement and new adaptations. The universe of the artist that the imagery evokes is far from that universe summoned up in the seventies under the name, among others, of everyday mythologies. It is not in fact a question of showing in detail the real-life emotional experience of an artist, but rather to emphasize the institutional aspect of his work which cannot develop without the help of partners (critics, agents) or privileged relationships. These are what led him to leave his studio in search of physical or mediatised contacts throughout the world. The support mechanism of the canvas once allowed the painting to travel (which the fresco obviously could not do), and allowed artists to develop the notion of studio, in both the geographic and aesthetic sense. Similarly, the spread of in situ practices, international exhibitions and trading on the art market have combined to transform the artist into a perpetual traveller, like the great painter-decorators of past centuries, creating works here and there whose status is not always well defined: are the works inextricably linked to their supporting milieu or are they liable to be displaced? Even the clear acceptance of a deontology, whatever it may be, will not always resolve the issue; one may witness paradoxical behaviour of in situ artists attempting retrospective or more autonomous artists playing in an almost a contrario fashion with the exhibition site. The concept of in situ/moveable is used to express these contradictions and to work within them. The pieces produced are therefore both subject to the demand of place (the position of the lights in Aachen, the design of the vaults of the ceiling in Middleburg, etc…) and so independent that they display the way they are to be dismantled for possible presentation elsewhere. The in situ composition uses the packing crate as an integral part of the piece or may even be said to consist entirely of this, as was the case for the work presented at the Anvers museum: fourteen packing crates piled up in a sort of ziggurat, and which can be stacked inside each other to continue the voyage. In in situ artists have in some ways become the great decorators of our time. I place myself in this contradictory situation of the decorator, and present a kind of friendly trial. Although this way of working is the most satisfying for me, I want to point out its paradoxes. Patrick Raynaud is a French artist who since 1976 has exhibited his works extensively in France and abroad, participating in particular in the Aperto section of the 1986 Venice Biennale. His works are suffused with the themes outlined above. Ingrained with irony, his in situ interventions often employ a minimal imagery, similar to children’s drawings. They are thus squarely in the mould of fiction, often reinforced by structures from literature, be it the travel diary or novel. The passage of time appears as one of Raynaud’s major preoccupations, from such varied images of degradation and death as consumption by fire, religious statues or an oblique geometry that evokes disequilibrium or destruction, to a recent focus on the paradoxical nature of the in situ work. Beaudet, Pascale, « Transports », Spirale, Février 1988, p. 7. "The truth of Don Quixote resides not in relation of words to the world, but rather in the close, persistent relationships that verbal signs weave among themselves. The dissatisfying fiction of epics has become the representative power of language. The words have closed over their function as signs"
In a figurative sense, Don Quixote is in fact a character who has escaped from litterature. His concept of the world was constructed from an accumulation of readings which end up creating images which he tries in vain to rediscover through his adventures. Thus, for this character, the references are inverted—his life becomes a novel and he considers novels to be historical documents. It is through this procedure that Cervantes questions the codes and concepts of literature, particularly those of the chivalrous tale. With the fiction of this central character, I began to draw parallels with photography. The latter is analogous to Don Quixote's extended view of the world in which, in his never-ending quest, he is continually bumping into the materiality of the image. In this obliteration of the boundary between the real and the imaginary, Don Quixote is emblematic of my field on interest in photography, centered on the indissociability of illusion and reality. In this project, the literary character of Don Quixote is transformed into a photographic character in order to question the codes and concepts of the poetic flower of the photographic image. This metaphorical transposition allowed me to develop certain themes proper to photography such as the fascination we feel for photography's reduplication of the real. It seems to me that Don Quixote, much like a view looking at a photograph, fictionalizes the real without ever having access to it. It also attempted to work out the theme of the mirror, in two different ways: the first as a representation of the imaginary world of the protagonist, the second as an undermining of the medium of photography itself. The list of themes could be developed further, but I think that this is a task for the spectator after looking at the work itself. My interest in this legendary figure stems not only from his relationship to photography but also from the nature of the character himself; although he emerges from the middle ages, Don Quixote speaks to us of the gulf that exists between words and things. This is what makes him relevant, current. Sylvie Readman is a Montresl artist. She presented a solo exhibition at the Articule gallery in 1982, at Dazibao in 1984, and at the Chambre Blanche in September 1987. She also participated in such exhibitions as "Fragments –Photographie actuelle au Québec", ogranized by the Vu Gallery in 1984 and "Narrativité-Performativité" at Optica Gallery, organized by C.Boulanger and J.-C. Rochefort in 1985. In addition, Readman made a colour Super-8 film in January 1985 which was shown at the Dazibao gallery and the Vu Gallery in 1986 and 1987. Her photographs have appeared in Scénarios, an essay by C.Boulanger published in 1985, and also in the special edition Femmes et photographie of la Nouvelle Barre du Jour (1984). Dumont, Jean, La Presse, samedi 28 novembre 1987. Gravel, Claire, Le Devoir, samedi 12 décembre 1987, p. C-9. Guilbert, Charles, « Don Quichotte et la démarche », Voir, 10 au 16 décembre 1987, p. 19. Legrand, Jean-Pierre, « Mise en scène d'une perspective », Vie des arts, #131, juin 1988, p. 70.